Pioneers in the industry, we offer industrial waste incinerator, hazardous waste incinerator, portable incinerator, medical waste incinerator and poultry waste incinerator from India. The ranges starts from 50 kgs/hr to 500 kgs/hr. The incinerators are designed as per CPCB New standards and guidelines. Aravali Thermal manufactures portable incinerators. The incinerators are available in various capacity starting from 5 kgs/hr to 200 kgs/hr. 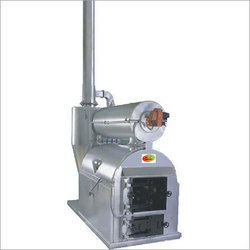 The incinerator are available in oil / gas / electricity. 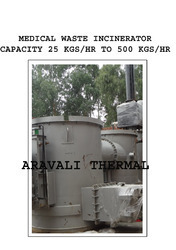 "Aravali Thermal" manufactures medical waste incinerator. The ranges starts from 5 kgs/hr to 500 kgs/hr. The incinerators are fitted with automatic feeding system, PLC based control panel, Air Pollution control device and 30 meter height chimney . 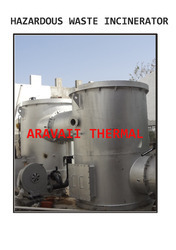 "Aravali Thermal" manufactures Poultry waste incinerators. The range starts from 5 kgs/hr to 500 kgs/hr. 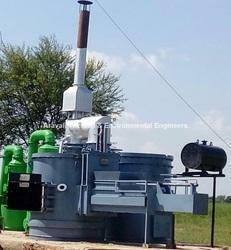 The incinerators are designed complete as per CPCB New standards and guidelines. The incinerators are fitted with automatic feeding system, Air Pollution control device, PLC based control panel and 30 meter height chimney.